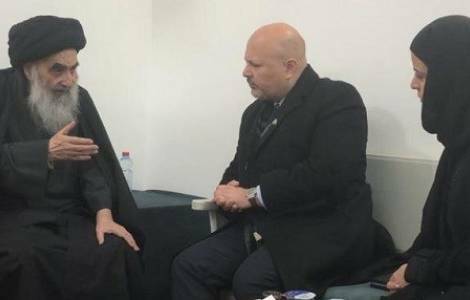 Najaf (Agenzia Fides) - Ayatollah Ali al Sistani reiterated the urgent need to investigate the violence and crimes committed by the jihadist militias of the Islamic State even to the detriment of local Christian communities, in the period in which they occupied large areas in northern Iraq. The Islamic leader - said a statement - expressed this request on receiving a delegation in Najaf led by the British jurist Karim Asad Ahmad Khan, at the head of the commission of investigation commissioned by the UN to collect documentation on the crimes committed by Daesh and identify the authors and those responsible. Al Sistani recommended the head of the investigation commission promoted by the United Nations to investigate in particular the "heinous crimes" against some members of Iraqi society, such as the Yazidis in Sinjar, the Christians in Mosul and the Turkmen in Tal Afar, concentrating research also on "abductions, slavery and sexual violence" suffered by women. AFRICA/CENTRAL AFRICA - War crimes: "Justice is essential for social cohesion and peace"
AFRICA/SOUTH SUDAN - A missionary: "In South Sudan there is an ethnic but above all political and power conflict"